The Yamato period (大和時代, Yamato-jidai) (250–710 C.E.) is the period of Japanese history when the Japanese Imperial court ruled from modern-day Nara Prefecture, then known as Yamato Province. The dates of the Yamato period actually encompass the archaeological Kofun (ancient tomb culture) period, and the historical Asuka period, which began with the introduction of Buddhism to Japan. By the sixth century, the Yamato uji (clan) had predominated and established a centralized government in the Yamato Plain near modern Kyoto. During the Yamato period, Japan traded and maintained diplomatic relations with Korea and China, receiving waves of immigration and many cultural influences. A system of writing was adopted, power was centralized, society became stratified and a government administration was set up based on the Chinese model. Buddhism, officially introduced in 552, was dominant by 600, and many temples were constructed. During the reign of Prince Shotoku in the early seventh century, a new constitution was adopted. While conventionally assigned to the period 250–710 (Kofun period c. 250-538, Asuka period 538-710), the actual start of Yamato rule is disputed. The Yamato court's supremacy was challenged up to some point during the Kofun period by other polities centered in various parts of Japan. It is known for certain that Yamato clans had a major advantage over their neighboring clans by the sixth century. This period is divided into the Kofun and Asuka periods by the establishment of the capital at Asuka, in modern Nara Prefecture. However, the Kofun period is an archaeological period, while the Asuka period is a historical period, and this concept of period division is now considered old-fashioned in Japan. A millennium earlier, the Japanese Archipelago had been inhabited by the Jomon people. In centuries prior to the beginning of the Yamato period, elements of the Northeast Asian, Chinese, and Korean civilizations had been introduced to the Japanese Archipelago in waves of migration. Egami Namio has popularized a theory that a powerful horse-riding race from the north brought about the dramatic changes of the later Kofun period. Archaeological evidence indicates contacts between China, Korea, and Japan since the prehistory of the Neolithic period, and its continuation at least during the Kofun period. The rice-growing, politically fragmented Yayoi culture evolved into the more centralized, patriarchal, militaristic culture of the Kofun period and Yamato society. The Kofun period (古墳時代, Kofun-jidai) dates from around 250 to 538 C.E.. The word kofun is Japanese for the type of burial mounds dating from this era. During the Kofun period, elements of Northeast Asian, Chinese, and Korean civilization continued to influence the culture in the Japanese archipelago, both through waves of migration and through trade, travel and cultural change. Archaeological evidence also indicates contacts between the mainland and Japan during this period. Most scholars believe that there were massive transmissions of technology and culture from China through Korea to Japan, evidenced by material artifacts in tombs of both states during the Proto-Three Kingdoms of Korea and Kofun eras, and the later wave of Baekje immigrants to Yamato. The archaeological record and ancient Chinese and Korean sources indicate that the various tribes and chiefdoms of the Japanese Archipelago did not begin to coalesce into more centralized and hierarchical polities until 300 C.E. (well into the Kofun period), when large tombs begin to appear during a time when there were no contacts between Wa (Japan) and China. Some describe the "mysterious century" as a time of internecine warfare as various local monarchies competed for hegemony on Kyūshū and Honshū. Japan was open to the introduction of Chinese culture during the Kofun age. Several kinds of apparatus were imported; books from China were one of the most important trade goods. The Chinese philosophy introduced during this era had an important influence on the history of Japan. Decorated bronze mirrors (神獣鏡) were imported from China, and Japan imported iron from China, by way of Korea, until the latter half of the sixth century. Daisenryo Kofun, the tomb of Emperor Nintoku, Osaka, fifth century. Kofun (古墳, "old tomb") are burial mounds which were built for the people of the ruling class during the fourth to the seventh centuries. The Kofun period takes its name from these distinctive earthen mounds, which are associated with the rich funerary rituals of the time. The mounds, some of which were surrounded by moats, contained large stone burial chambers. Kofun were made in many shapes, the simplest being round and square. A distinct style is the keyhole kofun (前方後円墳, zenpō kōen fun), with its square front and round back. Many kofun were natural hills, which might have been sculpted to their final shape. Kofun range in size from several meters to over four hundred meters in length. By the late Kofun period, the distinctive burial chambers, originally reserved for the ruling elite, were also being built for commoners. 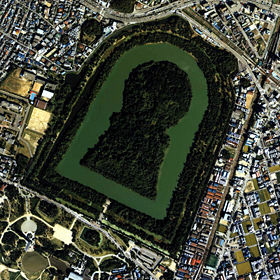 The biggest kofun are believed to be the tombs of emperors like Emperor Ōjin (応神天皇 Ōjin Tennō) and Emperor Nintoku (仁徳天皇 Nintoku Tennō). Kofun are also classified according to whether the entrance to the stone burial chamber is vertical (縦穴 tate-ana) or horizontal (横穴 yoko-ana). Japan of the Kofun Period was very positive towards the introduction of Chinese culture. According to the Book of Song (宋書), a Chinese emperor appointed five kings of Wa to the ruler of Baekje and Silla in 421. Yamato links to the mainland and the Liu Sung Dynasty in 425 and 478 were facilitated by the maritime knowledge and diplomatic connections of China and the Three Kingdoms Period of the Korean peninsula. Many important figures in Japanese history were immigrants from East Asia. The "Shinsen-Joujouroku" (新撰姓氏録), which was used as a directory of aristocrats, lists a number of clans from Han China, Silla, Baekche, and Goguryeo. When the Yamato Imperial Court officially edited the directory in the year 815, 290 Korean clans and 163 Chinese clans were registered. Haniwa horse statuette, complete with saddle and stirrups, sixth century. The Kofun period was a critical stage in Japan's evolution toward a more cohesive and recognizable state. Society was most developed in the Kinai Region and the easternmost part of the Inland Sea. The Japanese rulers of the time even petitioned the Chinese court for confirmation of royal titles. The Yamato polity, which emerged by the late fifth century, was distinguished by powerful great clans or extended families, including their dependents. Each clan was headed by a patriarch who performed sacred rites to the clan's kami to ensure the long-term welfare of the clan. Clan members were the aristocracy, and the kingly line that controlled the Yamato court was at its pinnacle. The Kofun period of Japanese culture is also sometimes called the Yamato period by some Western scholars, since this local chieftainship arose to become the Imperial dynasty at the end of the Kofun period. The Asuka period (飛鳥時代, Asuka-jidai) is generally defined as lasting from 538–710. The arrival of Buddhism in Japan is used to mark a change in Japanese society and a new influence on the Yamato government. The Yamato state evolved considerably during the Asuka period, which is named after the Asuka region, south of modern Nara Prefecture, the site of numerous temporary imperial capitals established during the period. The Asuka period is known for its significant artistic, social, and political transformations, which had their origins in the late Kofun period. The artistic style of the Asuka period is often referred to as Tori Style from the sculptor Kuratsukuri Tori (鞍作止利), grandson of Chinese immigrant Shiba Tatto. Tori Style inherited elements of the Chinese Northern Wei style. The arts during the Asuka and Nara periods were similar to contemporaneous art in China and Korea. One example of this is Tori Busshi (止利仏師)'s Shaka triad, which reflects the style of early to mid-sixth century China. During the reign of Prince Shotoku in early seventh century, a new constitution was created for Japan, based on the Chinese model. After the fall of the Baekje Kingdom (660 C.E.) the Yamato government sent envoys directly to the Chinese court, from which they obtained a wealth of knowledge about philosophy and governmental structure. In addition to ethics of government, they also adopted the Chinese calendar and many Chinese religious practices, including Confucianism and Daoism (Japanese: Onmyo). According to Nihon Shoki, Mahāyāna Buddhism (大乗仏教, Daijō Bukkyō) was officially introduced to the Yamato court through Baekje in 552. Based on the biography of Prince Shōtoku (Jōgū Shōtoku Houō Teisetsu, 上宮聖徳法王帝説) and the record of Gangō-ji (Gangō-ji Garan Engi, 元興寺伽藍縁起), Buddhism was introduced in 538. The initial reception of Buddhism was slow. Nihon shoki records that when Emperor Kimmei (欽明天皇) discussed the acceptance of this new foreign religion, Soga no Iname (蘇我稲目) expressed his support while Mononobe no Okoshi and Nakatomi no Kamako (中臣氏 ) (later the Fujiwara clan) opposed the idea, not on religious grounds, but because of feelings of nationalism and a certain amount of xenophobia. With the dawn of the Asuka period, the elaborate kofun tombs fell out of use for burials of the imperial family and other aristocrats, because of prevailing new Buddhist beliefs which put greater emphasis on the transience of human life. Commoners and the elite in outlying regions, however, continued to use kofun until the late seventh century, and simpler but distinctive tombs continued in use throughout the following period. Buddhism only started to spread after Mononobe no Moriya (物部守屋) lost the Battle of Shigisen in 587 and the Mononobe clan was crushed. Empress Suiko openly encouraged the acceptance of Buddhism among all Japanese people. In 607, an imperial embassy was dispatched to Sui dynasty China to obtain copies of Sutras. The Yamato state, (ヤマト王権, Yamato-Ōken) evolved still further during the Asuka period, which is named after the Asuka region, south of modern Nara, the site of numerous temporary imperial capitals established during the period. The Asuka period is known for its significant artistic, social, and political transformations, which had their origins in the late Kofun period. The Yamato court, concentrated in the Asuka region, exercised power over clans in Kyūshū and Honshū, bestowing titles, some hereditary, on clan chieftains. 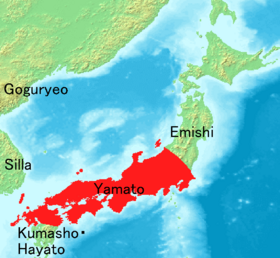 The Yamato name became synonymous with all of Japan, as the Yamato rulers suppressed the clans and acquired agricultural lands. Based on Chinese models (including the adoption of the Chinese written language kanji), they developed a central administration and an imperial court attended by subordinate clan chieftains but with no permanent Capital. By the mid-seventh century, the agricultural lands had grown to a substantial public domain, subject to central policy. The basic administrative unit of the Gokishichido (五畿七道 , Gokishichidō, five provinces and seven circuits) administrative system was the county, and society was organized into occupation groups. Most people were farmers; other were fishers, weavers, potters, artisans, armorers, and ritual specialists. 593: Prince Shotoku of the Soga clan rules Japan and promotes Buddhism. 600: Prince Shotoku sends the first official Japanese mission to China. 604: Prince Shotoku issues a Chinese-style constitution (Kenpo Jushichijo), based on Confucian principles, which de facto inaugurates the Japanese empire. 605: Prince Shotoku declares Buddhism and Confucianism the state religions of Japan. 607: Prince Shotoku builds the Buddhist temple Horyuji in the Asuka valley. 645: Prince Shotoku is succeeded by Kotoku Tenno, who strengthens imperial power over aristocratic clans (Taika Reform), turning their states into provinces. ↑ Keiji Imamura. Prehistoric Japan: New Perspectives on Insular East Asia, (University of Hawaii Press, 1996. ISBN 0824818520). Google Book Search. Retrieved April 20, 2007. ↑ Book of Song (Chinese). Retrieved April 20, 2007. ↑ W.G. Beasley, The Japanese Experience: A Short History of Japan, (Berkeley: University of California Press, 2000). Google Book Search. Retrieved April 20, 2007. ↑ 『新撰姓氏録』氏族一覧 (Japanese), transcribed by Kazuhide Kitagawa. Retrieved April 20, 2007. Imamura, Keiji. Prehistoric Japan: New Perspectives on Insular East Asia. University of Hawaii Press, 1996. ISBN 0824818520. Tsuboi, Kiyotari. 1992. Archaeological studies of Japan. Tokyo: Tōhō Gakkai. This page was last modified on 30 July 2013, at 21:16.